Recently I was browsing a museum catalog for netsukes, the carved Japanese ornaments which hang from kimono sashes on cords and function as pockets. Historically, netsukes were carved from wood or ivory and usually depicted animals. They are sought by collectors and featured in museums throughout the world. 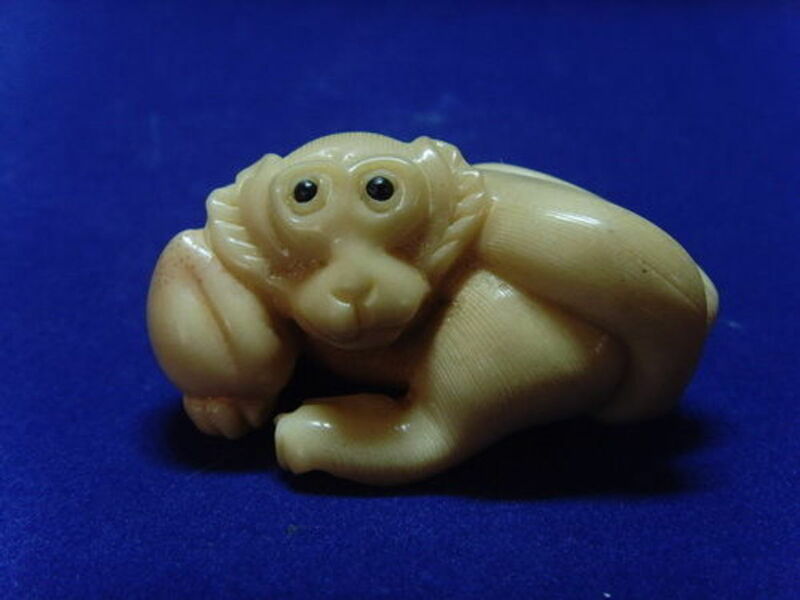 It is illegal to sell any carved ivory produced after 1947, so the classic designs are now reproduced in resin or "vegetable ivory", the white dense meat of the tagua nut from South America. Tagua, also known as Corozo, comes from a palm-like tree Phytelephas aequatorialis which grows in the rain forests of Ecuador. The tree, whose name actually means "elephant," thrives along the streams and tributaries of the Amazon, specifically the Napo River between Ecuador and Peru. These trees, which reach 20-40 feet in height, produce clusters of melon-size fruits which hold their seeds inside a hard horned shell. Started from a seedling, a tree takes nearly fifteen years before mature enough to produce fruits. One it reaches this stage, it is capable of fruiting for over a hundred years. Since the ripened fruits fall to the ground, the trees themselves do not need to be cut and harvested. A single tree produces about 15 fruits per harvest with each one containing about 30 tagua nuts. Each tree has roughly three crops per year, producing an overall yield of approximately 20-50 lbs. of vegetable ivory. In additional to the carvable nuts, the tree's fronds are used for roofing material, and the fruits are used as a food source unless left to fully harden. The center endosperm of these nuts is a dense white cellulose material that can be easily carved and dyed. It can also be carefully burned with a hot needle for pyrographic designs. Named "vegetable ivory," it is a sustainable resource for making figurines, beads, buttons, and other decorative items. The nuts are encased in the grapefruit-size fruits from the Phytelephas Aequatorialis tree. The white cellulose of the nut's endosperm is perfect for carving and dyeing. The nuts are harvested from the forest floor then allowed to air dry for 2 months or are placed in kilns to remove any residual moisture and kill burrowing insects.This process also increases the durability of the cellulose and prevents cracks as decorative pieces age. The outer surface of the nut accepts dye easily but doesn't allow complete saturation. This makes tagua perfect for sgraffito, scrimshaw, and other contrast carvings used for beads and buttons. 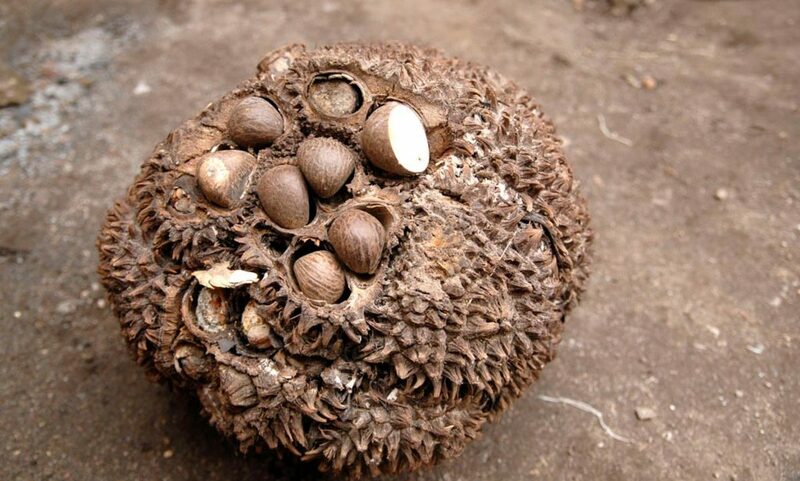 In the mid-1800s when trade between Europe and South America was in full swing, the corozo, or tagua nut, found its way into the hulls of the wooden trade ships to help stabilize them against rough seas and to prevent cargo shifting. The use of sand proved to be a problem and the plentiful palm nuts were a practical replacement. In the port of Hamburg, some of the nuts purportedly ended up in the pockets of Austrian woodcarver Johann Hille who went on to prove their carve-ability. Once this was discovered, demand for it skyrocketed, and the German Hellwig family built the first trading post in Manta, Ecuador around 1895. From here, exports went to Italy where artisans carved the tagua into beautiful buttons and returned them for commercial distribution. After the opening of the Panama Canal, the Zanchi family of Italy found the South American source of the corozo and established their own Ecuadorian trading post nearby. It was named Casa Tagua. Eventually, the two companies merged through marriage and had continued success until plastics replaced the demand for vegetable ivory.The decade of the 1920s had tagua exports bringing 5 million annually to the economy of South America! 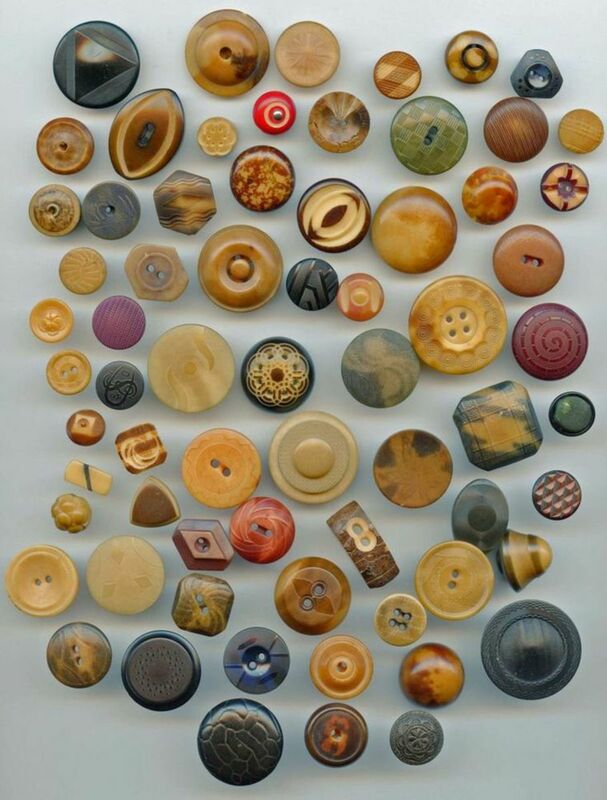 Earlier in England, a Venezuelan toymaker is believed to have introduced vegetable ivory through his wares, and the first buttons carved from the tagua discs were displayed in 1862 at the Universal Expo in Paris. By 1863, American production was set up in Rochester, NY and was going strong. France was soon to follow in 1870. During World War I, army uniform buttons were carved from vegetable ivory to incorporate the shank too. The metal used previously was in short supply and needed for weapons. Production of buttons became more mainstream and existing factories were converted to handle the demands of the uniforms. In 1918, 216,000,000 buttons were needed for the army's shirts alone! The leftover tagua waste was used by the Chemical Warfare Service for making the charcoal filters of the gas mask canisters. Little was wasted. By 1940, the increased use of celluloid, bakelite, and other plastics brought the production of vegetable ivory to a screeching halt. In the 1980s, vegetable ivory re-emerged as the shining star of sustainability due to the efforts of Conservation International. Patagonia ,The Gap, and subsidiaries like Banana Republic began featuring the eco-friendly buttons on their garments, and the trend soon spread throughout the high fashion industry. Vegetable ivory is also used in the manufacture of chess pieces, game tiles,umbrella handles, jewelry, decorative carvings, and musical instruments, including bagpipes. Carved tagua makes beautiful jewelry and is often combined with silver and other metals. Good quality pieces should be properly dried for 8 weeks before carving, allowed to cure for 2 weeks after being colored with vegetable dye, then sealed with a resin for durability. As long as it is not allowed to get wet and is kept from prolonged sun exposure, it will last for many years with nothing more than an occasional buffing with a soft cotton cloth. 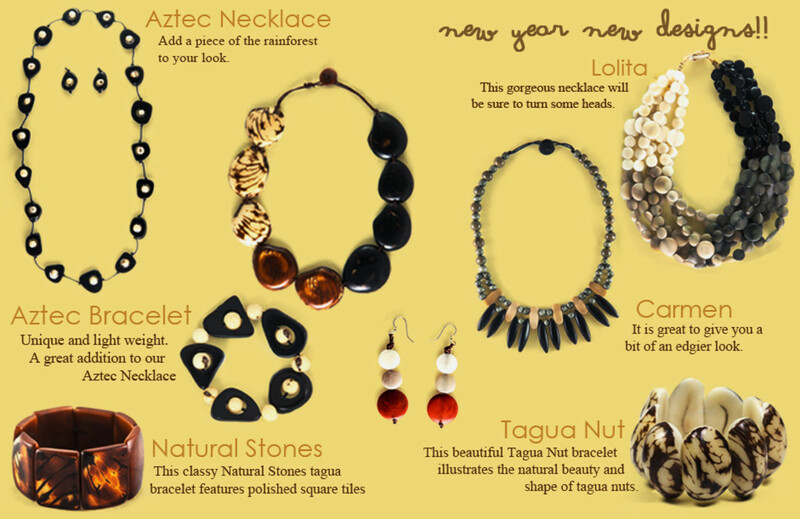 A catalog page from Organic Tagua Jewelry which displays the versatility that is possible when working with vegetable ivory. In one year, a tagua palm can produce as much "ivory" from its fruits as that which comes from a single elephant tusk! Tagua and other inferior grades of vegetable ivory have taken away any functional need for carvable animal products. Although the nuts are much smaller than tusks, they can be laminated together for larger objects. It is extremely disturbing that the ivory trade still exists due to Asian demand and that poachers continue to torture, maim, and kill the world's magnificent elephants and rhinos for money. Do NOT buy products made from ivory, horn, or horn-bill from birds. It cannot be harvested without great harm or death to these animals. In addition to the disturbing fact that one elephant is killed every 15 minutes, funds from the ivory trade have been linked to global terrorist activity through the purchase and transport of weapons. Award-winning director Kathryn Bigelow's poignant animated short film Last Days has been shown worldwide as a PSA to promote awareness of senseless elephant slaughter and its even darker repercussions. As long as there is demand for ivory tusks and rhino horn, poachers will continue to break the laws. It isn't easy to change cultural traditions and beliefs that have existed for hundreds of years. It can only be accomplished if new generations are educated to see the detriments of ancient customs and taught to embrace the benefits of this sustainable resource. Not only does tagua production provide a viable income for the indigenous people of the Amazonian rain forests, it reduces the need for other income-producing practices such as farming and raising cattle through slash & burn deforestation and land use. Vegetable ivory is a win-win for the economy and for our earth. 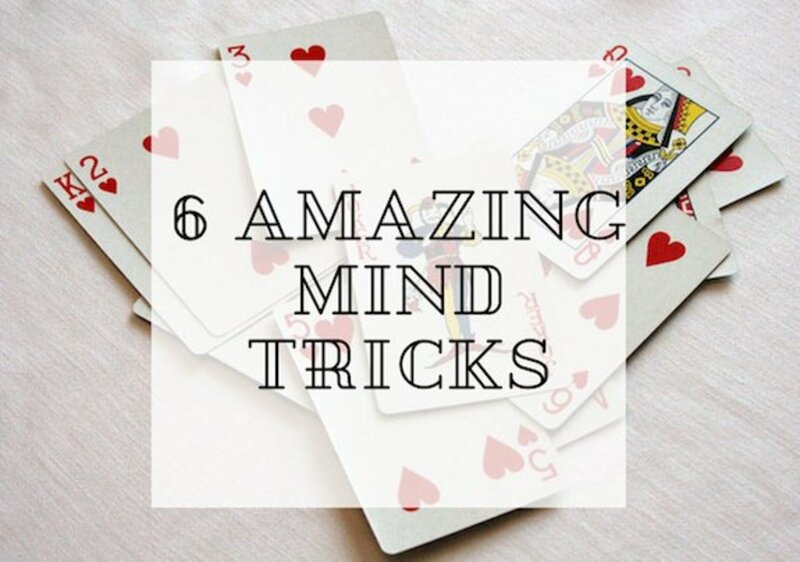 It would be a great idea to use these on piano keys, don't you think? Will it work? Just wondering. Thanks. So glad you've highlighted vegetable ivory here. The truth of the ivory industry is a sad, sad state of affairs...all for trinkets that one must dust or items some people will steal and kill for–sad. Yes, between tagua nut and organic resins for larger and more finely detailed carvings, there is NO need for ivory at all. Thank you for reading and commenting. It's cool that people can use something besides ivory to create these pieces. Thank you! I'm glad that my hub introduced you to ivory's eco-friendly alternative. Hello, Dave. 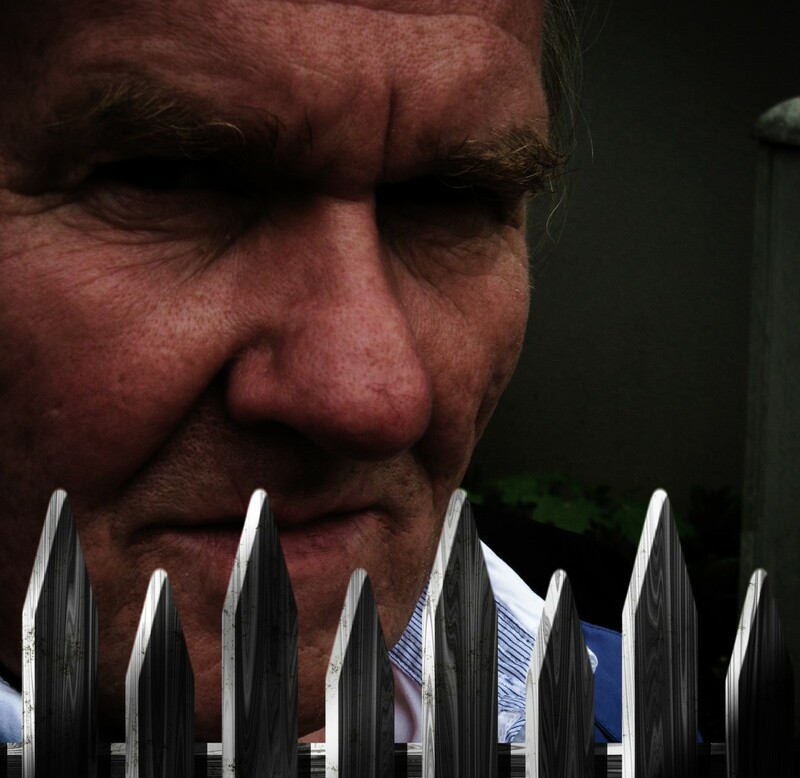 Thank you once again for stopping by to read and leaving your insightful comments. I fear that you are right in that there would need to be a lot of effort to stop the lucrative profits of illegal ivory trade, but I still feel that it is possible by continuing to bring the violent aspects of it into the public arena and educating each new generation. It is so sickening and has a profound impact once viewed. I am enjoying the new knowledge I've gained from reading your hubs too. Thank you! Once again I have added to my knowledge of the worlds flora thanks to you. If only the poachers would read this, but I fear there is no money in vegative 'ivory' and sadly that is what the senseless slaughter of elephants and rhino's is all about. great read and I share your sentiments. Voted up. Please spread the word! It will still take years for new generations to finally make changes with regard to the cultural demands for ivory carvings and rhino horn aphrodisiacs. Tagua nut is great for smaller projects. Bone, horns, and antlers of naturally deceased animals are other alternatives. Information about these sources and facts of horrific animal torture need to be circulated for awareness. Thank you for sharing your thoughts and concerns. I will be telling people about vegetable ivory. I hope that the demand for vegetable ivory soon makes ivory worthless and puts the poachers out of business. Great hub, thank you. Those that lack a sensitivity for animals are missing out on so much in life! Others that torture them have NO respect for the sanctity of life, regardless of species. The topic opens up the controversial subjects of hunting traditions, eating meat, etc. In cases like these, I look at nature . I accept carnivorous eating and hunting if it is done respectfully and with appreciation for the sustenance it provides. I have no tolerance for senseless slaughter or killing in the name of sport or greed alone. Thank you for sharing your thoughts and kind comments. 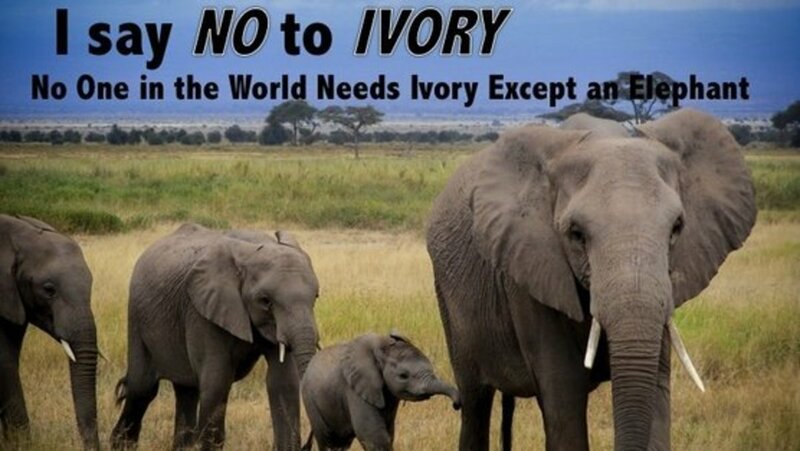 I hope you spread the word about vegetable ivory . My best to you! What a great article. This is the first time i have ever heard of Taqua (vegetable ivory). I could not bring myself to look at your video, when i looked at the seals being clubbed to death, i had nightmares for weeks afterwards, and when i see the t.v. adds about animal abuse i have to turn away. I will never understand how humans can be so heartless towards animals and towards each other. Thanks for a fascinating and informative hub. Hope it may end the slaughter of elephants. Passing this on. Hi Mhatter :) I'm finding that vegetable ivory is not very well known. That makes me all the more happy that I chose to write about it! Awareness of sustainable alternatives to tusks and horns is a first step to change. It's a pleasure to see you here. Thank you for commenting. This is the first I have heard of this. Thanks for adding to my knowledge. Hi Kashmir :) It always makes my day when I see you've checked on my new hubs! I greatly value your input and comments. I'm glad that you learned a bit about vegetable ivory. It's my dream to see an end to the ivory trade and the malecious slaughter of elephants. Take care! Hi cat on a soapbox great informative and interesting hub, didn't know any of this about vegetable ivory. Thanks for helping me learn more about this subject .